you've seen in Garden Gate magazine? Find it here! Our Annual Volumes provide the answer. Give a gift of Garden Gate... the gift that keeps giving all year! 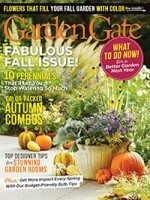 Share valuable gardening secrets only found in Garden Gate magazine with a 1-year gift subscription. It’s the gardening gift that arrives six times a year! To order multiple gift subscriptions, add each to your cart individually, and click the "Keep Shopping" button to return to this page from the cart. Click here to print your gift cards. Subscriptions will appear as a separate billing on your credit card statement. Click here for printable gift card options.